When it comes to cooling large buildings, there are several options to choose from. The standard central unit can be used, but alternative methods for cooling the space can also be considered. One alternative option you may not know about is referred to as chilled beams. This system type can be beneficial to your large space, as they provide both heating and cooling. 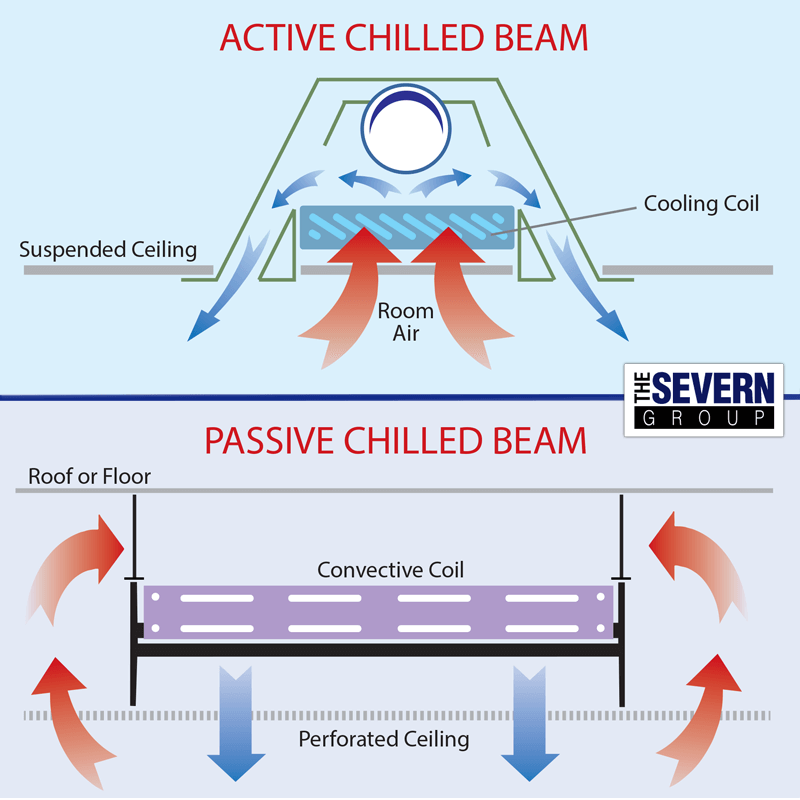 The chilled beam is an alternative to a conventional VAV system that separates ventilation and dehumidification. It’s composed of copper tubing and bonded to aluminum fins. Additionally, it’s housed in a sheet metal enclosure and is usually placed at ceiling level. Essentially, it is a fan coil without a fan that has chilled water piped to it that provides convective cooling. Ultimately, you can get the benefits of having underfloor air distribution with a ceiling-based system. As a convection HVAC system, chilled beams are designed to cool as well as heat large buildings. A heat exchanger, called a beam, will be integrated into the ceiling system or suspended from the ceiling with pipes of water passing through the beam. The beam will chill the air surrounding it, and the air will become denser. This air will then fall to the floor. The room is cooled via a convection method as the cool air is replaced by warmer air as it moves up from the bottom of the space. With this unit type, the heating primarily works the same, much like a steam radiator. Two types of chilled beams can be installed within a large space. A passive type of chilled beam will use convection to provide comfort in the area. A radiant/convective passive beam will cool by using radiant exchange as well as convection. When comparing the two-unit types, chilled beams have been found to be around 85% more efficient in using the convection method than a chilled ceiling. For the chilled ceiling method to work, the ceiling must be covered and consist of a large area. This will provide heating and cooling in the space from radiant workings instead of convective. A chilled beam system has several advantages. Particularly, the system typically has a lower operating cost. Cooled water temperature is higher than cooled air, but it provides the same cooling ability. This helps to lower the cost of this unit type. Because the building does not rely on the delivery of air for cooling or heating, it can run air circulation fans at a lower speed or not at all. It has been estimated that this system can handle anywhere from 25 to 50 percent less air than a traditional air delivery unit. There is also a reduction in the need for air distribution duct networks upon installation. As a result, this can help to lower the cost. Overall, when installing a new HVAC system within a large building, a chilled beam system is worth considering. With low installation and operating cost, building owners can easily spend less to create a system that works well to produce maximum heating and cooling.